As your business grows, the flow of materials tends to bog down as demand increases, forced through the same channels and processes. Throughput grinding slowly down is a story as old as warehousing itself. 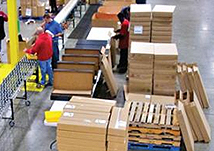 Frequently the operations that lag behind the rest of the process are in the picking, packing and shipping areas of your facility. What’s difficult is that these inefficiencies evolve over time, where they can almost be hidden from an analytical view. It seems that no matter how many people you throw at the problem they never catch up, and error rates escalate. Often the solution is in simple steps toward organizing your packing areas and putting supplies conveniently at hand. Think of throughput as a river running many miles through different landscapes. When the river is wide and the terrain smooth, everything is peaceful and serene – the flow is good. When the terrain narrows or changes suddenly, the river may go outside its banks or form raging rapids, with currents caught swirling , others squirting roughly out the end, and others inefficiently others drifting along. Flow is impeded and the river is thrown into chaos. This is fine in nature, but you can’t allow it in your business. In any order picking workflow, there are also smooth places and overflow or chaos in others. The important thing to understand is that each time flow is impeded, you’re losing money – or at least not making as much profit as you could. By understanding how work flows through your facility, you can repair some of those narrow spots and restore workflow to a more consistent state. It allows you to consolidate, condense and organize functions into ergonomic work centers. How materials arrive at a work station. Is it on a conveyor, cart, pallet or hand carried? How materials leave the area. Is it on a conveyor, cart, pallet or hand carried? Which stations cause bottlenecks in the flow? Are you losing efficiency at automation, technology or material handling points in the flow? Materials are stacking up after an automated process. Workers can’t keep up with the machinery. Once you identify your slow points, take a good hard look at the step-by-step tasks involved to keep materials moving. Watch how people move, how many times they touch the product or materials, how much time is spent in travel. Your goal is to cut down on steps needed, touches needed, and keeping people on the primary tasks without side trips. Make a list of the tasks done at each slow point and then add a list of required supplies and equipment needed to complete that stage in the overall process. Look for cluttered workstations. Find out where people have to go to use needed equipment. Are supplies organized and readily at hand? 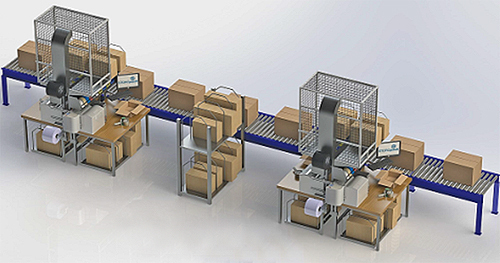 At packing and shipping locations, are the packaging supplies integrated into the workstation? Do workers have to walk to the bubble wrap dispenser, container flats, or dunnage? If you talk to your people, they usually tell you where the pain points are. The general idea is to provide them with a work area that doesn’t make them do much else other than pack, pick, ship or other designated activities. Having identified work stations where flow is pinched, you may find that additional work surfaces or a different form of organization is needed. This is where talking with an integration specialist like Cisco-Eagle is helpful. Professionally engineered workbenches and work stations can configure to meet your needs and reduce inefficiency. One workbench may have space for printing bills of lading and shipping orders for palletized materials. Another workbench may have rolls of packing wrap, tape, flat cartons, bubble wrap and freight scales all within the range of a few steps for the workers at that station. Another station may have a conveyor running right down the middle where totes of picked goods arrive, are checked, packed, and labeled then sent on their way down an outfeed conveyor. Reducing clutter in the work area – leads to improved workflow and faster throughput. Getting supplies and equipment up off the work surface allows for better visibility of materials and access to supplies as they are needed. It also reduces risky actions of reaching, lifting and stretching in order to access supplies and equipment. Knowing where scanners, printers, laptops and other electronic equipment is – instead of moving stuff out of the way, hunting for the right piece of equipment or figuring out where the shipping invoice is going to appear from the printer. When your workbench has configured places for equipment like scanners, printers and computers you speed throughput as well as get longer life from your equipment because it isn’t being dropped, getting knocked off the table or buried under other supplies and overheating. Workers know where equipment should be placed when done using it, and know where it will be when they need it. Keeping supplies and equipment within easy reach – but not on the work surface helps keep them out of the way, yet available as needed. Workers travel less and stay on task more. Efficiency of the work flow improves when supplies are easy to access. Replenishing supplies is also more efficient because everything has a consistent location. Workers don’t have to hunt for the tape, packing material, etc. It’s right there where they can reach it. Reducing the number of touches, movements and steps needed to get materials where they need to go – because workers no longer have to travel to complete their job. Everything is in within easy access. Materials arrive, tasks are completed and materials are sent on their way. Improve floor space usage – you often regain useful floor space because the work station has a smaller footprint due to the organization of equipment and supplies up off the floor and work surface. Making the work process safer and more efficient – modern, modular work benches allow you to pick choose which accessories you need at each particular work station – and change it when you need to. Envision the river of materials passing through your facility. Take stock of the narrow chasms, rough rapids and churning whirlpools where materials get hung up and throughput bogs down. Adding well designed work benches can smooth out those rough waters and put your operations back into a smooth, easy float out the door to your customers and dollars flowing into the profit side of your balance sheet. 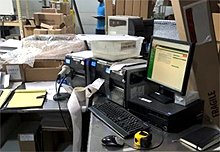 A Packer’s Point of View: In an often complex order fulfillment system, the packing area is too often treated as an afterthought – that’s costly to the organization. Configuring an Efficient Packing Station: Don’t focus packing workstation design solely around storage. Maximum efficiency comes from integration of the pack station into your operational goals, order fulfillment and material handling systems. A Guide to Ergonomic Workstation Design: Equipment, materials and supplies storage are always a workstation design issue. Organizing materials to coincide with the flow of the work creates efficiency.